It has been a hard twenty-four hours at REGI. The title of a childrens book I read my children and now grandchildren, has played in my mind all weekend. It is Alexander and the Terrible Horrible, No Good, Very Bad Day by Judith Viorst. The story made us all giggle. I could use a giggle. 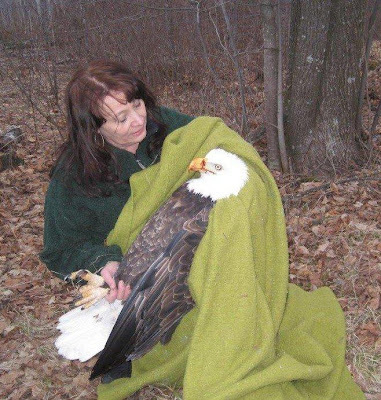 Sadly, the adult female Bald Eagle that was hit by a car in Crandon, WI died of her internal injuries. She was a stunning Bald Eagle , and one of the largest eagles we have had in the past twenty years from Northern Wisconsin. We did a necropsy on the eagle as we often do when we lose a patient. We want to know if there was something more we might have done or what we can learn for future cases. This beautiful Bald Eagle didn't have a chance. She was hit HARD. I've seen Bald Eagle patients hit by semi-trucks with less damage. The eagle had a ruptured liver, severe bleeding in both lungs, several broken ribs ( all on left side). She also had a fully formed egg in her oviduct. The egg would likely have been laid that night. The egg was crushed by impact. Being heavy with an egg, this mother eagle would not have been able to move quickly. We know accidents happen. Many of our patients are accidentally hit by cars. This sad case was different. The road where the eagle was found was a narrow county road. It was straight and had good visibility. Someone was going at a very high rate of speed to cause injuries this extensive. (likely traveling west on Keith Siding Rd.) If it was an accident, one would hope the driver would stop. That was not the case. The eagle was found by a passerby that braved the cold and stood by the eagle for well over an hour until help was found. I hope the coward that hit her is found out and feels some remorse for his shameful, mindless act. Our day was bad enough and then a call came from a party near Jump River. They had a hawk with a wing injury. I sent raptor banders and REGI volunteers Connie Decker and Ken Lupke to pick it up and get an ID, while we arranged transport. Education Director Steve Fisher brought the hawk out to REGI. Connie called to say the case made her sick. 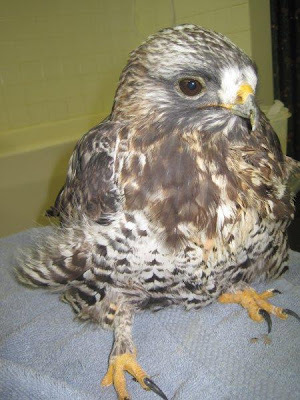 The hawk was a Rough-legged Hawk. They breed in the far north of Alaska and Canada near the Arctic Circle . They occasionally winter in Wisconsin. They are equipped with tiny feet and are specialists on small mammals. That makes them 100% beneficial to humans. It had likely been shot with a deer rifle. The damage is severe. He will never fly again, but we hope to be able to save his life and make him part of the REGI education team. The thing that makes this even worse is, for the past ten years, many hawks of all kinds, Snowy Owls and even Bald Eagles have been shot in this area. Experts feel it is a single individual or group. These people either have inadequate knowledge of raptors and their benefit to humans or are using the protected raptors as target practice. The birds appear to have all been shot from the road, usually in fall and spring. Sadly, this remote area happens to be pristine for wildlife and often is home to rare species and wintering special species like Rough-legged Hawks and Snowy Owls. The illegal and sick behavior of a few casts a negative shadow on everyone in the entire area. It's time to stop protecting the sickos and turn them in. 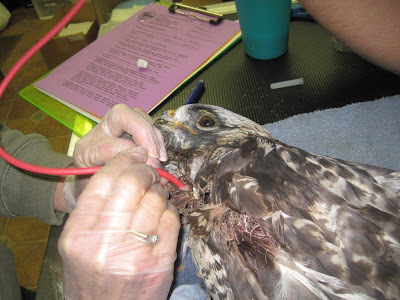 For reference, this is the only part of the state we have experienced this kind of wholesale killing of raptors. We did have some nice moments this weekend too. 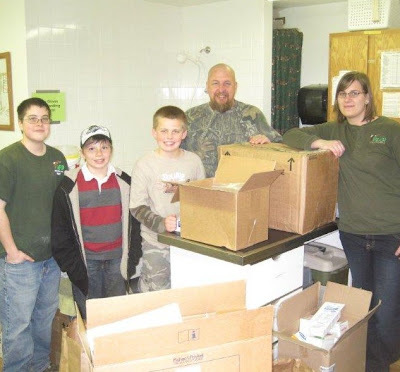 Dave Hoffman brought a load of medical supplies no longer able to be used for human health care. We really appreciate the help from Theda Care of Appleton and Dave for his thoughtfulness. Medical supplies are expensive and the donation helps so much. You will notice in the photo above we were able to use some within the hour on our critical patients. Education is key to preventing the situations that occurred this weekend. We embrace that hardily at REGI. Education is a big part of our mission. We will persevere and hope to make a difference in the future. Tomorrow will be a better day. 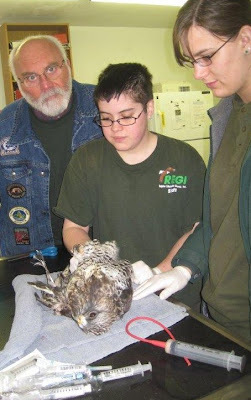 Wildlife rehabilitation is just like that.